A central concept in the work of John Levin is stylus pressure, not to be confused with tracking force. The more common measure is tracking force, meaning simply the force exerted by the stylus on the groove. This is measured in grams. Stylus pressure, on the other hand, refers to pressure per surface area, and this can vary greatly, as shown in Mr. Levin's table below. It is perhaps not surprising to see that stylus pressure for vinyl discs is high (the row "Audiophile LP cartridge" in the table), but there is also great variation in stylus pressure among players for cylinders. Note that the old acoustic Edison Automatic with its high tracking force actually exerts a little less stylus pressure than the modern ACT/Edisonia with electric pickup (described on these pages under the heading "Plug-and-play"). 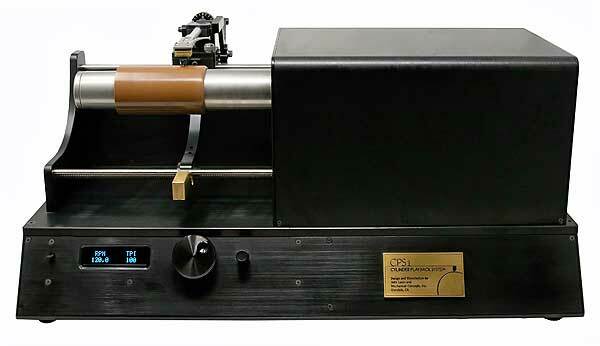 So, especially when playing fragile old brown wax cylinders, one would like to keep stylus pressure low. 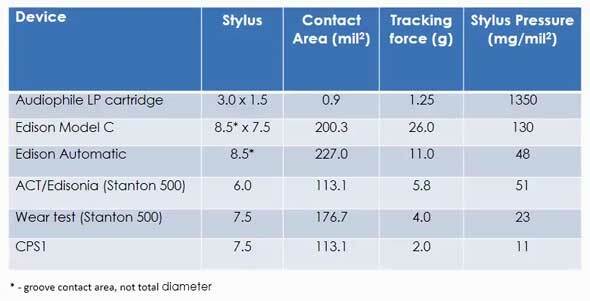 This means that for any given tracking force, the stylus should be as big as possible. But here another aspect comes into play: the stylus has to be small enough to follow the modulation of the groove even for the high frequencies, which points to the need for a more narrow geometry in the line of travel. The following table, which Mr. Levin bases on work done by the ARSC Cylinder Subcommittee, shows the necessary stylus dimension for the reproduction of high frequencies at full modulation. Actually, the stylus can be bigger that this measure, but the bigger the stylus, the less well it will trace higher frequencies. As shown in the table, another way of solving the high frequency problem is to increase the recording speed, which stretches the modulation of the groove and improves the reproduction of high frequencies. The rotational speeds shown, 120 and 160 rpm, are the standard speeds for mass produced cylinders. 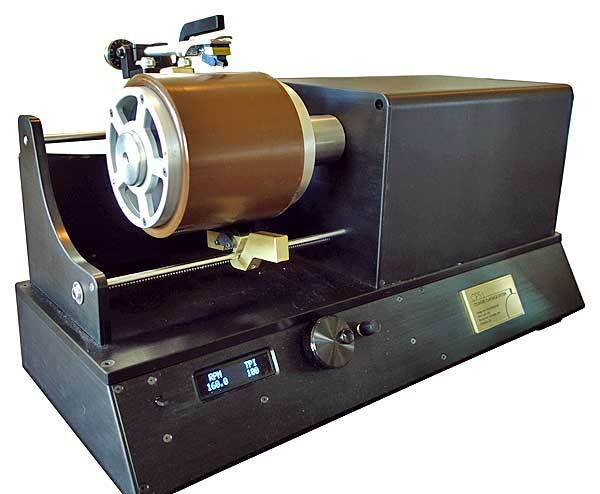 This cartridge sits in a player that takes standard size cylinders, 6" and Busy Bees, both wax and celluloid. There are also slip-on mandrels for other sizes. Speeds range from 15 to 220 rpm. 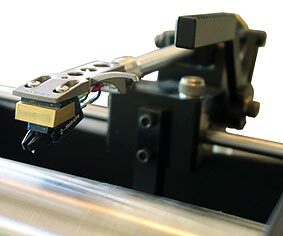 The tonearm assembly is feedscrew driven, and the player also contains a preamplifier with balanced and unbalanced outputs without RIAA correction. 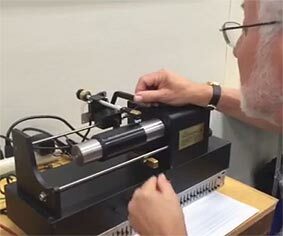 John Levin starts playing a cylinder. It takes a two-hand grip, one hand on the tonearm lever, the other engaging the feedscrew. A close-up of the tonearm assembly.